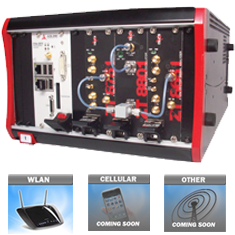 ZTEC Instruments (http://www.ztecinstruments.com), recently introduced the industry’s highest performing multi-protocol modular RF test set. The ZT8221 was designed to solve the problem of achieving the lowest possible EVM (Error Vector Magnitude) while also keeping price palatable and allowing for ease of use. The ZT8221 combines their newly released 2 to 8 GHz local oscillator (LO), the ZT8801, with a 6 GHz VSA (ZT8651) and 6 GHz VSG (ZT8751) in a single chassis. The test set also comes pre-loaded with ZProtocolTM WLAN, the company’s 802.11a through ac protocol analysis and waveform generation software. “Engineering managers consistently face the challenge of measuring the lowest possible EVM and at the same time keeping test costs low,” says ZTEC Instruments president, Christopher Ziomek. “Designers today feel an ever increasing pressure to reduce EVM contribution to qualify 802.11ac devices for new electronic designs. The low residual EVM floor of the ZT8221 helps them distinguish contributions of the test equipment from that of their devices. Our test set performance surpasses bench top equipment and at a fraction of the price,” adds Ziomek. The ZT8221 provides 160 MHz of instantaneous bandwidth, 500 MHz of modulation bandwidth and 0.3% EVM floor for 802.11ac 80 MHz devices. As of January 2nd , the ZT8221 is shipping in high volume. ZTEC Instruments believes that the future of test and measurement requires tightly integrated instrumentation and computing solutions. This combination facilitates the current trend toward shorter development times, increased flexibility, lower cost, and smaller size in test and measurement systems. We believe the future of test and measurement lies in reliable, future-proof modular instruments. ZTEC offers modular RF, digital storage oscilloscopes, and waveform generators using the PXI/PXIe, VXI, LXI and PCI platforms. These are well suited to automation. For more information about ZTEC Instruments, please visit http://www.ztecinstruments.com.